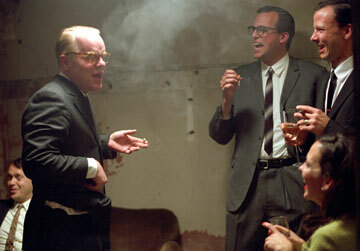 Cinecultist:Do We Smell Oscar For Philip Seymour Hoffman? Do We Smell Oscar For Philip Seymour Hoffman? There's certain indie actors out there who invoke an instant "Lord, I LOVE them" response from nearly every discerning movie goer you encounter. Philip Seymour Hoffman is surely one of them. Heck, so are Catherine Keener and Chris Cooper. Luckily for their fans like Cinecultist, all three are in a simply wonderful movie in theaters now, Capote directed by Bennett Miller. Hoffman plays the titlar New Yorker writer while he is researching and writing his classic non-fiction novel In Cold Blood. His friend Nell Harper Lee (Keener) travels with him to Kansas shortly after a family is murdered in their home mysteriously one night and the quieter Nell helps the sophisticate Truman get in to their small society. The twist (you know, if this were just a film and not actually "real" life) occurs when Truman's efforts to befriend one of the killers, Perry so as to get his story spirals out of Truman's control. For a small budgeted film, Miller and co judiciously create their late '50 milieu like real pros. Why construct an elaborate Manhattan street scene with period cars and loads of extras when a meditative shot of the Brooklyn Bridge with just less light shining from the city works just as well? The filmmakers understand that a better use of time is to cut from those timeless but simple establishing shots to interior party scenes with Truman holding court as the ultimate wit. Here is the man utterly in his element and Hoffman just shines in these bits, though he is perfectly delightful through out. It's so lovely to see movies with flawed characters like Truman, not a perfect person but sometimes brilliant and sometimes weak or completely self-centered. Real filmmaking like this should be rewarded with your $10.75. Don't miss it, CC expects (or at least sincerely hopes for) big things for Mr. Hoffman come Oscar time.